Twinkle Khanna's posts on social media never fail to amuse us. And, today, with a picture of husband Akshay Kumar, the author shared a 'tip for Indian men.' The couple flew out of Mumbai last night and are currently vacationing in an undisclosed location. 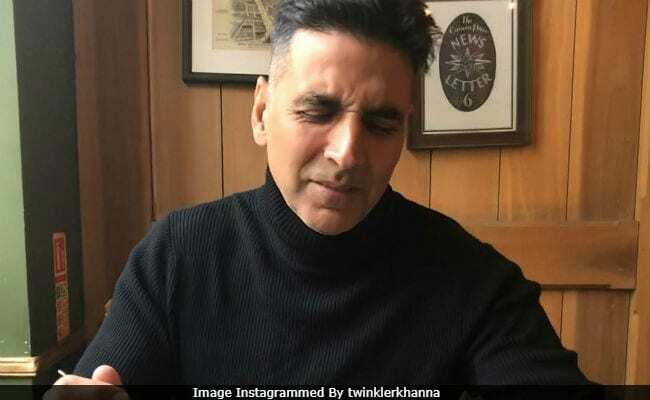 Twinkle's post features Akshay in a black turtleneck sweater as he looks at a jar of granola kept on the table. 'Exponentially smarter,' she called Akshay, who in return called her 'maha pakau.' (ROFL!) Here goes the story: "A tip for Indian men: A black woolly turtleneck can make most of you seem exponential smarter, especially if you don't ask the woman sitting on the other side of your precious jar of granola what 'exponentially' means. Also, it doesn't help if you call the other person 'maha pakau' when they try to help you by giving you the correct definition," Twinkle posted. Months ago, Twinkle shared a picture of herself doing yoga with her hair set in rollers and Akshay took the opportunity to click her. Here's how the photo turned out to be. Akshay Kumar, 51, and Twinkle Khanna, 45, have been married since 2001. They are parents to son Aarav and daughter Nitara. Akshay Kumar, last seen in 2.0, will be next seen in Kesari. He began filming Good News with Kareena Kapoor a few weeks ago. He also has Housefull 4 in the pipeline. Twinkle Khanna, a former actress, is now a best-selling author. Pyjamas Are Forgiving is her latest book.